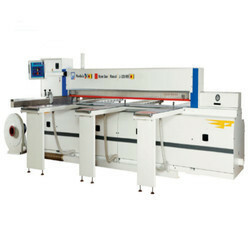 Leading Manufacturer of beam saw j-320 ab (auto) and beam saw j-320 mb from Sirhind. Advanced saw carriagewith high feed rate driven by rack / pinion that ensures high cutting accuracy. Theroust gripersensure perfect panel clamping without damaging the material surface. Thealignersliding on guides ensures precision on cross-way cuts. A uniform holdingpneumatic clamping beamensuring synchronized cylinder actuation at both ends. 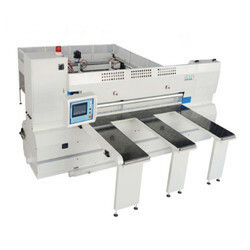 Automatic device for theoptimisation of the blade projectionin relation to any material thickness. Equipped withinfeed air floating tables. Three front air floating tables for smooth & better feeding movement of workpiece. A uniform holding pneumatic clamping beam ensuring synchronized cylinder actuation at both ends. Advanced Saw Carriage:An advanced saw carriage with high feed rate driven by rack / pinion and guided on hard guide rods that ensures high cutting accuracy. A uniform holding pneumatic clamping beam ensuring synchronized cylinder actuation at both ends.Saw Carrige Drive Motor:The saw carriage is driven by a motor. Variable feed speed for different applications. Touch screen with PLC control, provide safety and quick speedy cutting. Scoring Saw blade Adjustment:Can be adjusted vertically for depth of cut control. Once wear occurred, adjust its position for compensation.The scoring saw blade also can be adjusted laterally for alignment to main saw blade. Mortising Chain Set Prince 1/2"x 36 Links X1.3/4"